However, there is a bit more to it than just making goals and striving to achieve them. The “striving” aspect needs a bit of sports psychology to fully achieve the goals that the athlete sets out. Sports psychology involves a mix of visualization, awareness, control, concentration, understanding, relaxation, and confidence. 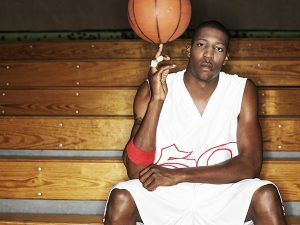 There are many approaches to improve sports psychology in basketball players. One must first understand what sports psychology is and how it can benefit the athlete. For example, basketball players need to tune into the exact sound that gets them going, one possible sound could be the crowd cheering and rooting for their team. Once athletes are out on the court and they hear the crowd roaring, their motivation to achieve peak performance greatly increases. The emotional experience gained from removing the blocks enables the player to focus on and in their performance zone is really something that drives athletes to accomplish their goals much easier. The first sports psychology center opened up in the 1920’s. Since then, the study of the psychology of sport has been of great interest to many psychologists. In the 1970’s, sports psychology was part of university curriculums nationwide and more focus and research has been placed in this field in recent decades. Mental training and other exercises are also created to improve emotional strength among players. I recently worked with a College Basketball team. They were struggling with free-throw accuracy. I took seven of the team members and had them make 50 free throws to get a base line. I customized a mental training hypnosis for them and then had them shoot another 50 free throws. We tabulated the difference between the before and after hypnosis. Their overall percentage of free throws made increased by 7% from 73% to 80%. The best improvement was 24%. Four players improved 10% to 24%. The other three were about the same. This all took place after a 2½ hr. practice. In their next game, their field goal percentage improved by 15%. In the following game, our test players again made 87.5% of their free throws. As a by-product their field goal percentage jump up 10- 18% over the next few games. The psychological importance of an athlete needs more attention than many think. Sports psychology sometimes can make or break an athlete’s day, week, or month while competing for his team or for himself. At the same time, sports psychology can help an athlete get out of a slump or maintain his or her high peak performance. Either way, when an athlete is not only physically, but mentally and emotionally strong, they can achieve all of the realistic goals that they set for themselves.